Since 2010, I have been anticipating writing a historical novel. 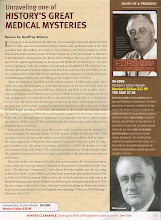 As the intimate truth of FDR's daily ordeal has never been told, and there is still a predominant belief in the version created by Howard Bruenn and sanctified by James MacGregor Burns, the only way to avoid a firestorm of critique and write what I sincerely believe to be the most accurate account is to write "fiction". The first installment follows below. It has not been a good day. The President of the United States is sitting alone in his wheelchair swaddled in blankets on the deck of the heavy cruiser USS Quincy, a ship expensively retro-fitted with an elevator and other conveniences, as many he had traveled on previously in order to accommodate the extraordinary physical needs of the Commander-in-Chief. FDR has been avoiding Sam Rosenman, his speechwriter who joined the return cruise from Yalta in Algiers, specifically to assist with his anticipated address to Congress upon his return. The speech is perhaps the most important FDR will ever give, a report on negotiations with Churchill and Stalin and to lay out his plan for a world peace organization that will shape the future of the world. Yes, the brilliant phrase from his first inaugural “we have nothing to fear but fear itself” instilled hope for the downtrodden millions in the throes of the worst economic crisis America had ever endured. Surely “a date that will live infamy” was the masterful catchphrase that led his countrymen into four years of vicious and costly armed conflict. But this speech is very different. For nearly a quarter of a century Roosevelt has fought health problems that would have relegated a lesser man to a life of solitude and retreat, overcoming crippling polio and keeping the ravages of cancer and the long-standing knowledge of its inevitable and fatal return in check for a decade. But now time is rapidly running out, and he knows it! It is the last chance to establish a legacy, to succeed where Woodrow Wilson failed and plant the seeds of The United Nations. The cold Atlantic wind is strangely refreshing to the veteran seaman, a slap in the face to a mind that has increasingly frequent and severe lapses of function. He must focus as his body betrays him. It did not help that his daughter Anna informed him at breakfast that the nearest person he had to a real friend, his Chief of Staff “Pa” Watson, had succumbed to a stroke suffered on board three days earlier. Always ready with a light-hearted quip, the devoted Watson was a year younger than Roosevelt and, like him, had been dealing with heart disease and prostate problems for years. It was not just the loss of a confidante that affected Roosevelt so deeply, but also the bitter reminder that his own tenuous grip on life was nearly at an end. He had known of Watson’s death watch for three days but never made the trip a few decks down to sick bay to see him. It was just too painful to bear witness, just as it had been after the stroke suffered in 1941 by his paramour and devoted companion of two decades, Marguerite “Missy” Lehand. This speech must be given to a live audience; it was simply too crucial for radio and edited video as he had done for his State of the Union address in January before leaving for the Crimea. Nor was there time to call in the professional make-up artists from Hollywood as he had before to disguise the ravages of his disease. Now the charade of vitality could no longer be kept up. Standing behind a lectern was no longer a viable option. The first lesson was in August at the shipyard in Bremerton, Washington when pain was an unwelcome accompaniment to an hour long address on the fantail of a docked destroyer. The searing pain in his back from erosive invasion of his spine from a mere five minutes of standing on January 20th at his fourth inauguration pushed him to the limit of what even he could endure. Over and over, Roosevelt pondered how he would reveal to the American public what had been painstakingly guarded from the public since he became President. A pronouncement of this monumental importance could not extemporaneous, the master orator and showman who orchestrated meticulous control every word and gesture of his public appearances would have to commit it to memory, nor would he share these most intimate thoughts with Rosenman. For the first time he would be publically wheeled into the chamber of the House of Representatives and transfer himself into a comfortable chair to present the address. Even then, no permanent visible record of this event would be permitted, enforceable only by virtue of the airtight control of the media he, with the help of his Press Secretary Stephen Early, had cultivated over twelve years. Day after day, over and over, Franklin Roosevelt searched for the answer. Finally it came. In the end it was just too much out of character for him to directly say, in effect, “ Look, I am crippled”. The appeal would be indirect, for empathy rather than pity. “Pardon me for the unusual posture of sitting down. I hope you will understand that it is easier for me not to have to carry around ten pounds of steel on my legs, and also because I’ve just made a fourteen thousand mile trip”. Now that the really hard part was over, he could summon Rosenman to embark on the tedious business of speech writing. The cachectic and spent Harry Hopkins, soon to be hospitalized at the Mayo Clinic, had abruptly left the Presidential entourage at Algiers without briefing Rosenman. In FDR’s compromised state, his patience with his old friend was short and their unknowing final parting was curt and less than cordial. Rosenman had been in London during the Yalta Conference. He was well aware that the address to Congress was to focus on FDR’s desire to be seen as the great mediator between Stalin and Churchill. The first draft that he had already crafted was dismissed out of hand. Even after five additional attempts, the President informed him that he would ask his son-in-law, John Boettinger go over it after they reached Washington to make yet further revisions. In all, there were six drafts before the carefully worded thirty-one double-spaced typed pages of the reading copy were placed into a loose-leaf binder to be carried into the historic chamber of the House of Representatives.